Dr. Bibiano “Boy” Fajardo validates a trainee’s assessment during a training in Malaybalay City. PASIG CITY, Philippines- In response to the rising number of individuals who expressed their desire to learn traditional Hilot healing so they could help out their family and friends, the Association of Traditional Health Aid Givers Philippines (ATHAG) is organizing an in-house Hilot training geared towards providing participants with the basic knowledge and skills to begin performing traditional Hilot for their loved ones. Individuals wishing learn how to optimize their health and prevent diseases the natural, Filipino way are also encouraged to attend. 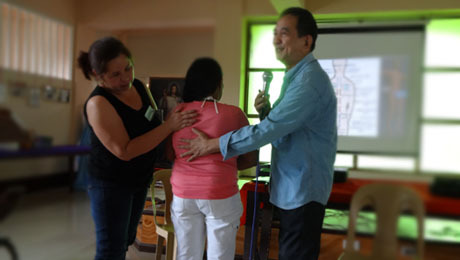 The training course will be taught by Dr. Bibiano “Boy” Fajardo, who has been healing with Hilot for almost 50 years and and is the pioneering proponent of the science behind Hilot healing. As you take part in the training, you will learn about the the philosophy, concepts, and principles underlying traditional Hilot healing. You will discover how the state of your mind/emotions affects the health of your body, as well as the process of how your body gets out of balance, and eventually, gives in to disease. After the first module, you will be able to perform the age-old Hilot method of determining imbalances in the body simply by feeling with your hands. You will already be able to address these imbalances through traditional Hilot and herbs, and prevent them from worsening into dreaded chronic diseases. The first module is divided into four (4) sessions that will be held on April 21, 23, 25, and 28, 2014 from 6:00 p.m. to 9:00 p.m at the office of the Association of Traditional Health Aid Givers Philippines (ATHAG) in Bo. Kapitolyo, Pasig City. Learning fee is Php 2,500/participant. For inquiries and registration, please email hilothealing@yahoo.com or use the contact form below. You may also call (0922) 884 4568 or (02) 267 4012. Slots are very limited (maximum of 15 participants only). Reserve your slot today! Salamat sa pagbisita sa site namin at sa interes mong matutunan ang Hilot. Sa ngayon inaayos pa lang po namin ang schedule ng mga susunod na trainings. Padadalhan po namin kayo ng e-mail kapag may bago na pong schedule. Sige po, balitaan n’yo po ako. Thanks po! Reblogged this on HILOT HEALING. kailan po muli ang training para sa hilot? Salamat po sa iyong interes na matuto ng Hilot. Sa ngayon po ay nag-aayos pa din po kami ng iskedyul. Antabayanan lamang po ang aming website o ang aming facebook page para sa updates. Mayroon po ba kayong training either sa San Fernando Pampanga or Angeles City? Sa ngayon po wala po kaming nakaschedule na training sa Pampanga. Antabayanan niyo na lang po dito o sa aming fb page kung magkakaroon. Salamat po!